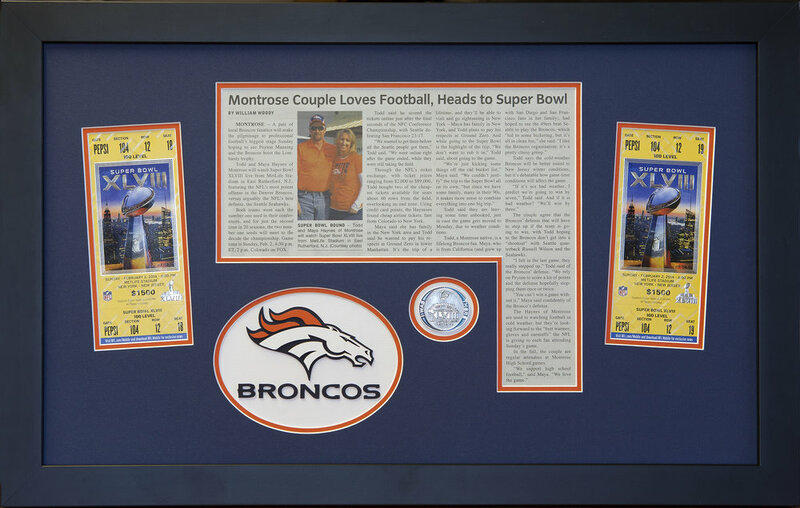 When we frame a piece of your artwork or memorabilia, we feel like we are handling a small piece of your family history that tells your personal story. No matter the delicacy of your one-of-a-kind art pieces or memorabilia, we believe it’s all about creative design that will bring your cherished memories to life. Every creative frame design is crafted with state-of-the-art framing equipment including the best computerized mat cutter used to create perfect cut corners and precise, unique designs and materials. Retrieve your family treasure from out of that dark, hidden spot and display it on your wall in a custom frame designed and created at Tim Frates Laser Engraving and Custom Framing. Click on any image to enlarge and begin a slideshow of the images below. Just like it sounds. When you have a piece of art on canvas, or a photo on canvas, we can wrap it around the edges of a frame. The image is the frame. It gives a piece some pop. It's ideal when you have a large horizontal space or wall to cover. We can break a large image into two or three images and by leaving space between them create a unique experience, sure to capture attention.